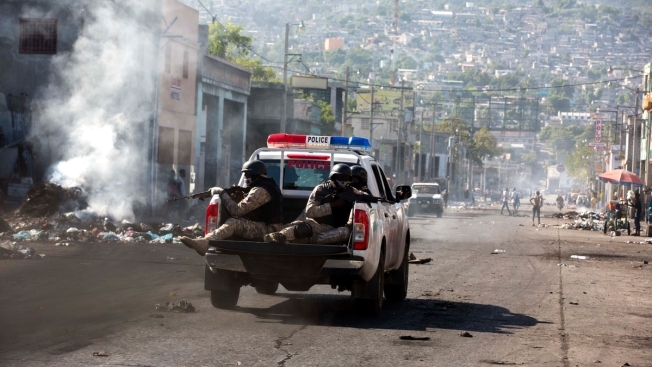 National Police patrol during a strike that is part of protests demanding to know how Petro Caribe funds have been used by the current and past administrations, in Port-au-Prince, Haiti, Monday, Nov. 19, 2018. Much of the financial support to help Haiti rebuild after the 2010 earthquake comes from Venezuela's Petro Caribe fund, a 2005 pact that gives suppliers below-market financing for oil and is under the control of the central government. Haitian police say one of their officers has been killed by a street gang and much of the country is paralyzed by a second day of protests over allegations of government corruption. Police spokesman Gary Derosier tells The Associated Press that the officer was riding in a motorcycle taxi that was stopped at a roadblock run by a street gang, who fatally shot him and burned his body in an alley. Schools are closed and most other activities around the country are stopped a day after six died in clashes between protesters and police. Demonstrators are calling for the president to resign for not investigating allegations of corruption in the previous government over a Venezuelan subsidized energy program, Petrocaribe.